A cynical, lazy, lasagna-loving, Monday-hating, dog-punting, mailman-mauling fat cat. 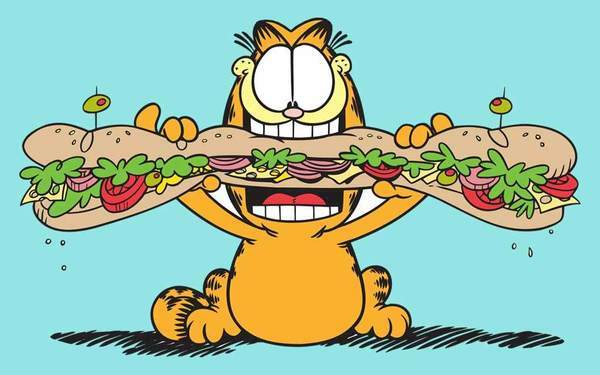 Garfield's passion for food and sleep is matched only by his aversion to diet and exercise. Garfield and his human Jon Arbuckle debuted on June 19, 1978, and have been enduring/endearing one another ever since. Garfield's design has evolved steadily since his first appearance in 1978. Though he's lost a little weight and gone bipedal, his heavy eyelids remain a noted constant over the course of four decades. His signature look is typically only be disrupted by situations involving things like stimulants, fear, and presents. 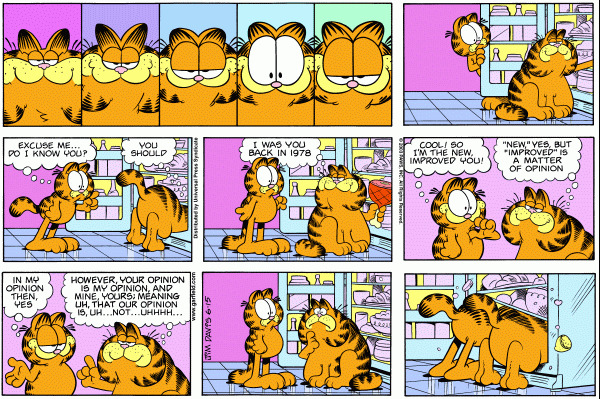 In 2003, Garfield met his original self in a week-long celebration of the strip's 25th anniversary. Such is the power of comics. 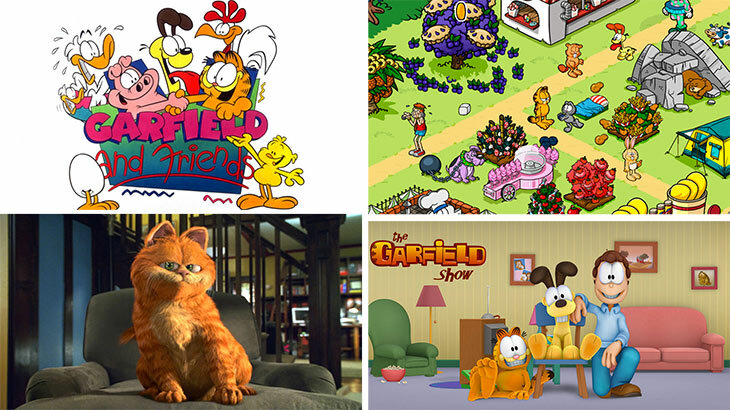 Garfield has appeared in more than 12 animated TV specials, 2 animated series, 2 live-action feature films, 3 animated movies, plus scores of video games across all manner of consoles and mobile devices. 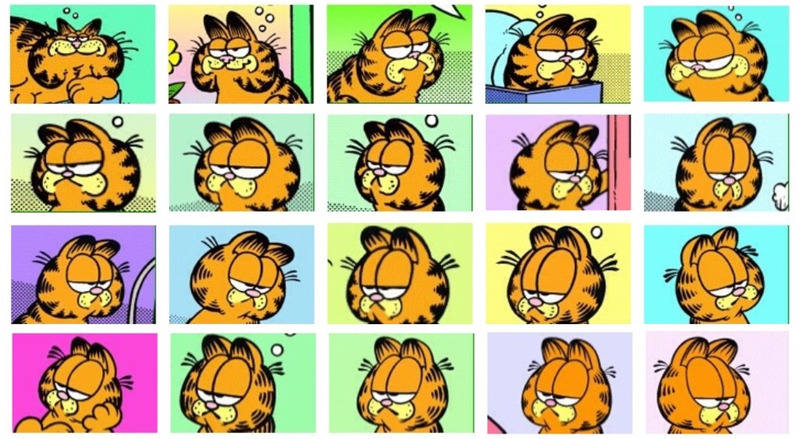 Garfield also has a second comic book series, separate from his daily strip. If that's not enough, there's even a Garfield musical... with Catitude. 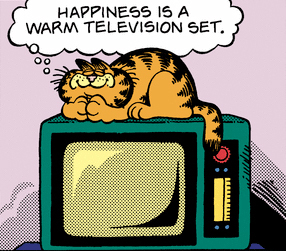 From October 23-28 of 1989, Garfield confronted existential dread in a strip about the power of loneliness and denial. It remains the weirdest Garfield storyline in the strip's 40-year history. • Garfield stars in a Pokémon GO style AR game on mobile devices called Garfield Go [LINK]. • The eBayGarfields Twitter collects some of the wackiest merchandise in Garfield history [LINK]. • In 2017, Garfield creator Jim Davis teamed with Dinosaur Comics writer Ryan North on special Galactus story in Marvel Comics' Squirrel Girl #26 [LINK].